Software Engineering describes the conceptual bases as well as the main methods and rules on computer programming. 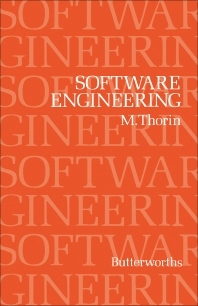 This book presents software engineering as a coherent and logically built synthesis and makes it possible to properly carry out an application of small or medium difficulty that can later be developed and adapted to more complex cases. This text is comprised of six chapters and begins by introducing the reader to the fundamental notions of entities, actions, and programming. The next two chapters elaborate on the concepts of information and consistency domains and show that a processor can take into account only imperative, occasionally adverbial, statements written in an artificial language. The third chapter explains how to define the general characteristics of actions so that they may be expressed using an artificial language conceived by an interlocutor of Indo-European idiom. The fourth chapter looks at general and technical criteria, and the fifth chapter deals with all the fundamental structures of entities. The final chapter considers a rational method of determining the actions. This book is a valuable resource for software designers and students taking computer courses.